Today, one way or another we were going to resolve our Internet problems. Having discovered that our Service Provider had changed some deeply technical aspect of its “service” which was impacting seriously our prehistoric modem, the simplest solution would be to replace it. The lack of internet access meant that there was no digital solution available, so our only alternative was to use the old analogue method, and go to the shop. Our Internet Service Provider is one of the largest in France, part of a huge world-wide conglomerate with at least three outlets in Nancy, so we were confident that it would be no simple thing to walk into a store, hand over some money and walk away with the product that we wanted. The first store was closed, for reasons not explained but possibly related to the bullet holes that riddled the shop window. At the next, a smiling helpful person told us that despite having the object of our desire in front of her in a glass case, nothing was possible but she would talk to someone on the phone for half an hour in case something changed in the meantime. Sadly nothing changed, and she thought that perhaps the people in the store around the corner could help. The third store, if appearances were anything to go by, was busy. We took a number, noting that we were ninth in line and that the two assistants were deeply ensconced in customer service. Eventually, as is the way of these things, a lovely young lady took us under her wing, took our money, gave us the new modem and four sheaves of paperwork and we hope our internet problems may well be a thing of the past. I can’t imagine when the Art Nouveau movement was in full swing in Nancy, that the building foreman would have been told that he couldn’t have his doors because Wood Carver v2.0 wasn’t compatible with Blacksmith v7.0 so he’d have to revert to Draftsman v3.2 and start again, but perhaps those were simpler times. Technology is great when it works. 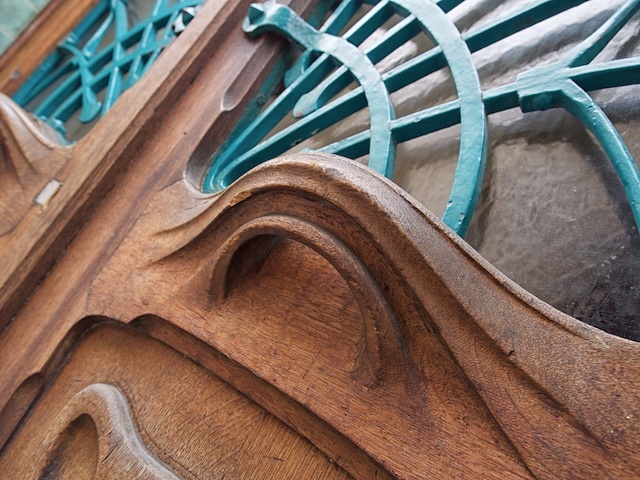 Love your approach to this fine art nouveau detail.